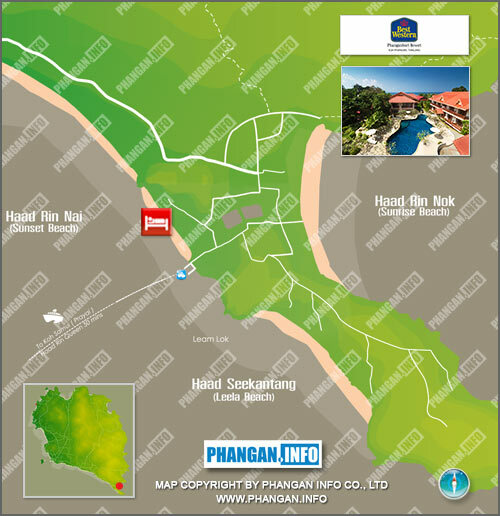 Haad Rin Nai is situated on the west side of the Haad Rin Peninsula in the south-east area of Koh Phangan. It is about 20 minutes drive from main port town of Thongsala or 10 minutes from Baan Tai; however it should be noted that the road between Baan Tai and Haad Rin is very hilly and should only be attempted by experienced motorbike riders; it's best to get a taxi or hire a car. From Thong Sala car taxis regularly go to Had Rin Nai, which is also the home of Had Rin's Pier. From Haad Rin Nai Pier it is possible to take the Had Rin Queen Ferry to Big Buddha in Koh Samui, or take a taxi boat to anywhere on the island.